With the green movement in full swing, we as consumers are surrounded by green alternatives to the things we have always used. Some examples of this are the new Starbucks splash sticks, green cleaning solutions and cloth grocery bags. Personally I think this whole green movement is a bit of a buzzword filled farce to keep consumers interested in the same old products or companies but I digress..
Reusable grocery bags first started to appear in Walmart stores across the nation in late 2007. They cost $1 each and are meant to be brought back to the store each shopping trip and used instead of using the plastic grocery bags. The benefits of reusable grocery bags are mostly environmental. The bags use less energy to produce and are meant to be reused. The bags are also made of canvas and therefore won’t rip in the event there is something heavy or sharp in them. The immediate downside that I see to the reusable bags is that they are inconvenient. You have to remember to put them back into the car when you are heading to the grocery store. They are also smaller and less flexible than a plastic grocery bag and I would guess that sometimes you may buy something that is too oddly shaped to fit into the reusable bag. Here are the reasons we don’t use them. They cost money. We are a frugal family and try to avoid unnecessary costs. Reusable bags are an unnecessary cost. When we go shopping, we fill at least 10 plastic grocery bags because we wait till we absolutely need to go shopping before going. That’s a $10 cost if we switched to reusable bags and were able to squeeze all our groceries into them. The second reason is that I know myself. I know that I will forget to bring the reusable bags and will then have to use the plastic bags anyway. 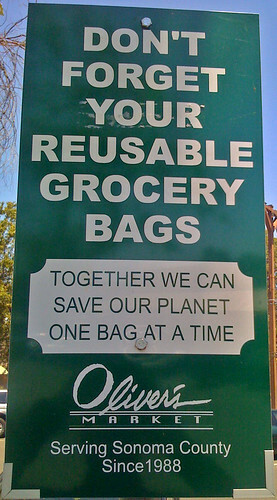 If I was devout in using the reusable bags, I might even purchase more if I forgot to bring those previously purchased. I know some people that thought they could handle the hassle and now have 30 reusable bags sitting in their garage. They have resorted back to plastic bags. The main reason we prefer the plastic grocery bags is that we reuse them! Bags don’t have to be made of canvas or whatever for you to make good use of them. We have been saving and reusing plastic grocery bags since we first started shopping. We use them to store things in closets or pack things in when we travel. We also use them to organize some of our hobbies that come with baggage. We have dozens of other uses for the plastic bags we save! My point being things don’t have to be made to be reusable for you to reuse them. Long before everything was greenwashed people reused stuff, believe it or not. Some people have and always will do things that are conservative and naturally protect the environment and others will ignore all the green hype and still throw their crap on the highway from their Hummer. In your experience are reusable bags worth the cost and effort? Yea! I also read some stuff that I didnt include in the post because it was a bit of a tangent, but the plastic bags are actually not as bad for the environment as people would like to believe because the manufacturing process has been refined so much over the years. Paper bags are almost 5x worse considering energy required to produce and recycle. The problem with the plastic bags is much moreprofound in countries where the population is in the billions. In those countries, as in the United States, it is not the production but the disposal of the plastic bags which are detrimental to the enviroment. The opinion put forth in the article excludes these countries and insinuates that one must purchase the reusable bags sold at the grocery store, which is untrue. A person is welcome to bring a bag they already own, talk about saving money. I have seen first hand how detrimental improper disposal of these plastic bags can be while soending time in highly populted countries AND I have seen how easily and efficiently people adjust to no longer being allowed to use them. Green craze aside, it doesn't hurt to grab the back pack you already own to run to the store. Emily, thanks for you input. My thoughts on the subject were a bit top level and one-sided, simply from my point of view, limited that it is and I apologize for that. I would love to publish some concrete positive information about using reusable bags as a followup including any and all information and reasons you, and any others that are pro-reusable bags could provide especially input from overseas and how other countries handle growing population and related waste. I have around 10 reusable bags in the back of my car, and like using them when I remember to do so. They are more comfortable to carry, and I put them by my purse when I am done unloading them – so that I can put them back in the car when I leave. Even though they are there, I often forget to use them. They cost me nothing. Earthbound Farms Organics gives some away (online), and my grocery store gave me a few as well (a free bag w/purchase coupons). I have a few that are handmade that someone gave to me. My grocery stores give a nickel credit per reusable bag used, and that is actually why I started to use them – any amount of money is an incentive to me. I don’t see that they do great things for the environment in particular, but it is a matter of getting into the habit of using them. I also shop for someone else who wants paper and plastic bags to use as garbage bags, so it’s sometimes one too many things to remember when I am shopping for her and myself as well. Welcome, Yana and thanks for your input from the other side of the fence. Like I said, I have never used the reusable bags so have never experienced how they match up in the comfort department. In your case, I can see clearly why you joined the reusable bag community. If there was a credit here, I would jump right on that especially if you could get the cloth bags for free. 5 cents a bag may not sound like much but that’s 50 cents a trip for you and if you shop often, that could surely add up. I think if there was a tax incentive, or store credit like this, more people would be encouraged to use these. I would argue that reusable bags are MORE convenient. I keep a stash of them in the back of my car, they are larger and sturdier than plastic bags, easier to load and unload, and MUCH more comfortable to carry. .-= corrin´s last blog ..Attention Bookworms â€“ A GIVEAWAY =-. I do the very same as you do and re-use the plastic bags I get at grocery stores rather than just tossing them. I also use green cleaners for a couple of reasons: First, there are no harsh fumes. Second, if for some reason someone were to drink the cleaner, it’s non-toxic. You basically just have to have the child drink water and there is no harm done. For me, those are 2 big incentives to use the green cleaners. .-= Amanda´s last blog ..Smile More, Glower Less =-. I have heard from many “users” that they keep them in the trunk of the car. If I were to switch, that’s what I would do to make sure I was never without them. Where did you get the bags and about how much can they hold compared to the plastic bags? I admit, I use a green dish washing soap, but only cos my Mom was in town and paid for it 😉 and those are really good reasons to use the green cleaners… a child recently died in my company because she/he drank toxic chemicals and there was nothing the mother could do afterward. Of the links I provided in the first paragraph of the article, I am all for green cleaners if they truly are green, not just the same toxic chemical in a ‘green’ recycled plastic bottle or some crap like that. I am not a fan of the Starbucks splash sticks as you can see from my comment at the bottom of that article. I have always hated plastic grocerty bags because they break if you put more than a few things in them. I have also notices in the last few years they have gotten smaller and thinner, so they are even worse. I irritated the grocery clerks by asking for larger things to be put in paper, requested boxes at the checkout stand, and used plastic for smaller items. I also insist on bagging my groceries myself so I can put all the frozen stuff together and all the bathroom stuff together. So I was thrilled when I bought my first reusable bag from Kmart. It was huge and just right for cereal boxes, crackers and other light dry goods. Then I decided I needed a cooler bag for my frozen goods. I found a great one that is the size of a small cooler but folds flat. Then I realized that all those cloth bags that I have recieved at many school functions and business conferences are great for groceries as well. I probably had collected 30 of them in a closet and didn’t know what to do with them. Now I stuff all these bags inside the cooler bag and keep them in the car. I also put all my coupons I get in the pocket of the cooler bag so I have them at the checkout stand (I always forgot them at home before). Now when I go shopping I can actually color-code my gorceries so when I get home the kids know that everything in the green bag goes in the bathroom (our bathroom is green). Everything in the white bag is dry and goes in the cupboard, everything in the red bag is fresh and goes in the fridge, etc. I think it is crazy how “green” everything has fone and it may be more hype than anything. But bringing my own bags to the store has made shopping fun again. Your organizational tactics here are pretty great and my post is really limited to the bags I have seen which are all small. Apparently there are many alternatives to the small bags sold at the checkout at grocery stores and I should dig a bit deeper. If I do try out any of the reusable bags I find or make, I will surely let the world know about it. Thanks for you comments Mother. I use reuseable bags pretty much exclusively. I don't think I've bought any of them (I have at least 15, and have given away extras), as they're often given out at conferences and community service events. Even the very cheapest ones have lasted ages–the two I carry virtually every day in my bike panniers are 50 cent ones and I've been using them for a year. They're also much more comfortable, and the majority of mine hold far more than plastic bags do. I walk to the store for small trips and also leave a bag or two in my car. I generally shop for groceries on my way home from work, so it's just second nature to grab my coupon file, store ads and a couple of bags and throw them in the car so they're ready. Mary, thanks for sharing your take in this. A funny thing happened just recently and I was put in a situation where I actualy thought, I wish I had one of those canvas bags.. I took my daughter to the library for the first time. She's three. We got a couple book and when I went to the library when I was a kid, I always remember the bag I would get to put my books in. It was a canvas bag, witha handle just like reusable grocery bags. Well, this library didn't give those out to new card holders, so I was pretty disappointed. My point being, there are certainly uses for reusable bags such as these. Personally, I don't see a reason we would ever use them for groceries, because we have a different lifestyle and actually use the plastic bags a ton, but people are different and as you have shown in your example, some get a ton of use out of these bags and make them worth having around. Mary on Is Auto Assure a Scam? Mary on Amazon Prime Review – Is It For You?